Pond Boost Beneficial Bacteria - 10 lbs. Home Beneficial Pond Bacteria Pond Boost Beneficial Bacteria - 10 lbs. The natural, biological way to clean large ponds! Pond Boost is a proprietary blend of specialized bacteria, formulated specifically for the task of lake and pond maintenance. Pond Boost contains specialized bacterial strains as well as other necessary ingredients needed to support these bacterial strains in lake or pond setting. Our unique blend of bacteria accomplishes a number of very specific tasks. Certain bacterial strains specialize in the removing of excess ammonia, nitrates and phosphorus from the water. 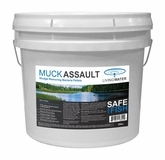 These excess nutrients, if not removed, can stimulate nuisance aquatic growth. Other strains focus on clarifying the murky water caused from animal and plant wastes, while simultaneously reducing or eliminating the odors stemming from those wastes. Other strains target the reduction of sludge on the bottom of lakes and ponds. Ponds treated with Pond Boost are treated every two weeks. Ponds that are really dirty can be treated more often, or at a higher dose to speed up the cleaning process without any threat to fish or other aquatic life. 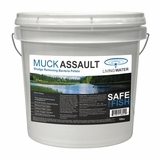 Formulated for use in larger ponds.